Prisoner Hunger Strike Solidarity (PHSS) is a coalition based in the Bay Area made up of grassroots organizations & community members committed to amplifying the voices of and supporting the prisoners at Pelican Bay & other CA prisons while on hunger strike. People of Color Organize - People Of Color Organize! is a website journal and media source produced by organizers supporting critical thinking, strategic work and direct action for social, racial, and economic justice. The website features debates, events, and trends within and emanating from the revolutionary left on matters of race, national oppression and self determination efforts. While unapologetically left in orientation, People Of Color Organize! is non-sectarian and offers a diversity of viewpoints from many movements. Critical Resistance - Critical Resistance seeks to build an international movement to end the Prison Industrial Complex by challenging the belief that caging and controlling people makes us safe. We believe that basic necessities such as food, shelter, and freedom are what really make our communities secure. As such, our work is part of global struggles against inequality and powerlessness. The success of the movement requires that it reflect communities most affected by the PIC. Because we seek to abolish the PIC, we cannot support any work that extends its life or scope. Incite - Women of Color Against Violence. Yo Is This Racist? - ask if it's racist. he'll tell you! Hari Kondabolu - According to the Seattle Times, Hari Kondabolu is “a young man reaching for the hand-scalding torch of confrontational comics like Lenny Bruce and Richard Pryor.” Like his comedic heroes, Hari Kondabolu wants to speak truth to power with confrontational and personal material. Unlike them, he does not want to die of a morphine overdose or set himself on fire. Committee to Connect the Dots - CCD seeks the end of white supremacy. As anti-capitalists, our work is focused on dismantling the prison industrial complex as a strategic site towards this aim. We also highlight the intersections between the prison industrial complex and other struggles for self-determination. We function within a feminist and queer liberation praxis. 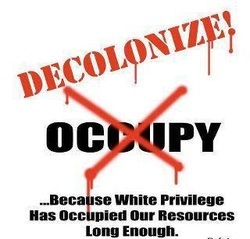 Decolonize Oakland - Decolonize Oakland (formerly the QPOC/POC caucus/committee of Occupy Oakland) would like to reintroduce ourselves to you, our communities, as an autonomous collective. We believe that working autonomously will give us the freedom to build power from below. Portland Liberation Organizing Council - The Portland Liberation Organizing Council is in its beginning. PLOC is developing as -an organizing network to foster connections amongst groups engaged across the radical-political spectrum to build and nourish relationships, share skills and resources, and facilitate strategic coordination. We will work to create and exercise this council framework through embarking on an initial project together, a space liberation on May 1st. This specific project would provide an initial alignment of energy and focus for involved groups, provide for a space that could anchor this evolving work, and exercise politics through action. Black Working Group - Occupy Northeast - "The Black Working Group" is a Portland, Oregon organization of African/Black people dedicated to advocating and agitating on behalf of Black people while working in soldiarity with the Occupy Wall Street movement. Working on behalf of African/Black people to battle against oppression. Working to keep Black people in their homes and resisting foreclosure. Working to build community defense against police terrorism.